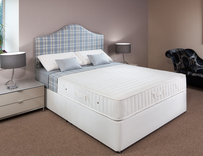 We hand make all our range of comfortable single divan beds, small divans and single storage beds in our Glasgow workshop. 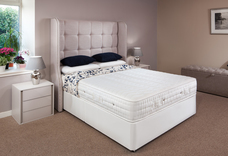 All our single divan beds can come with 2 drawers or full ottoman storage to make the most of the floor space and provide ideal storage solutions for a small or guest bedroom where space is limited, for extra storage or as a useful place for keeping the spare bed linen. 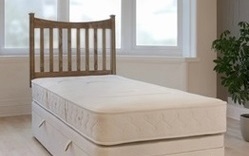 Our single divans are very popular as children's beds, as a single guest bed or for rental and student accommodation. 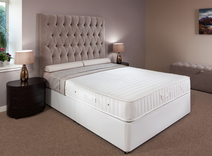 As suppliers of the hotel trade and interior designers as well as the public you can be sure of the quality, durability and reliability of our products. 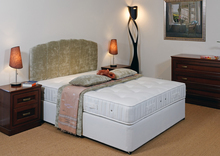 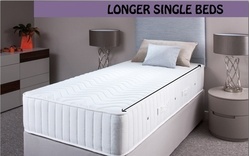 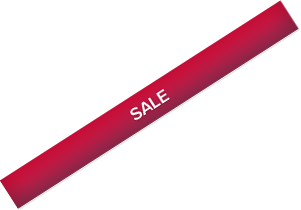 The mattresses with our single divan beds come in various support categories covering, medium, firm, extra firm and hard levels of firmness so whatever your size, weight or budget our carefully chosen range of single (3ft) size divan beds guarantee there is one designed for you. 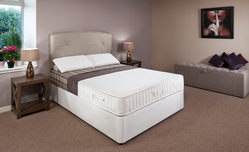 We regularly deliver throughout the UK including to Glasgow and west Central Scotland, Edinburgh, Aberdeen, London, Manchester, Birmingham, Liverpool, Newcastle, Cardiff, Aberdeen, Kent, Surrey, Sussex, Suffolk, Hertfordshire, Bedford, Buckinghamshire, Berkshire, Oxfordshire, Cambridgeshire, County Durham, Lincolnshire, Wiltshire, Hampshire, Somerset, Dorset, Devon & Cornwall, Gloucestershire, Cheshire, Shropshire, the Midlands, Norfolk & East Anglia and the North West of England.